Oh this is pretty! I do love wedding dresses. And it’s a great idea to how them on the doll, I like that a lot. I was looking at prom gowns. I love anything exotic like beading and stuff. Perhaps you could do some really nice ones! By the way do you think we could have a mermaid tomorrow since monday we got a pilot??? I loved the pilot btw you have an amazing talent and all your outfits seem so carefully designed and researched. just a suggestion for whoever wins the contest, the Japanese color gown would be great colored! or maybe the regency gown she posted a while ago it was pretty. Tomorrow’s spoken for, I’m afraid! 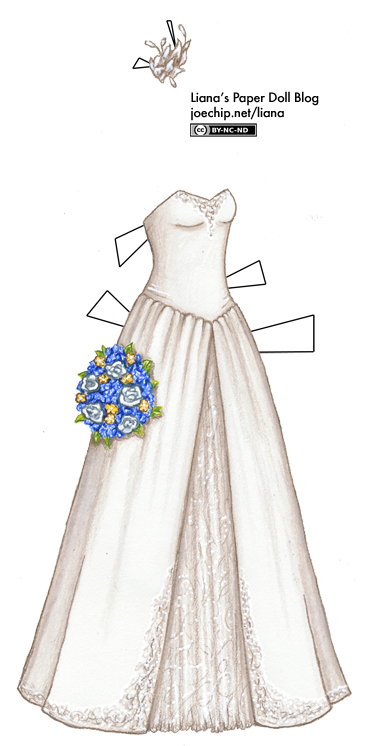 Probably you will have to wait until next week for a mermaid, unless I can’t think of anything to draw..
oh i love looking at wedding dresses. say yes to the dress is one of my favorite tv shows :) thats really funny because two days ago i made a bracelet with yellow and blue, and now its one of my favorite combinations! wow. it looks really pretty :D simple, yet elegant. I suggest maybe, JUST maybe, you should try doing a wedding dress inspired by kimonoes! the other paper doll sites are nice…but yours is definately the best! Pretty! I like the A-line but the strapless style is getting old. And I agree with Ophelia, you are the queen of paper dolls! Fourth number counting from the right? Wouldn’t that be the second number…? I really love how it looks showing it on the doll. This is my favorite of your dolls too. I hope to see more like that. Awww… Thank you Liana for linking me!! That’s really sweet!! totally love the dresses! 2 nice 2 be true! so, did you ever go to abracombie and fitch? well i love your desings so much i dont even want to go no more!